When you look at Terry Butcher’s interests – from childhood to adulthood – a pattern starts to emerge. Whether it be other wrestlers or bulls or boats or bass, it seems that he’s always wrestling with something. And for the most part, Butcher has come out near the top. In his current career as a Bassmaster Elite Series angler, Butcher had his best season in 2010, finishing fourth in the Angler of the Year standings and qualifying for his second Bassmaster Classic. That helped bump his career earnings on the B.A.S.S. circuit over $500,000. The other common thread in Butcher’s pursuits of wrestling, bull riding and bass fishing is competition. While the previous two put up some roadblocks in terms of physical wear and tear on his body, Butcher, who turns 40 on July 3, plans to stick with bass fishing for awhile. “As long as I’m enjoying it, I don’t have a time frame for quitting,” Butcher said. Bass fishing does occasionally remind him of bull-riding, like when he’s trying to motor over five-foot swells in Lake Erie. But that’s a far cry from getting knocked unconscious, which happened to him 15 times during his bull-riding days. 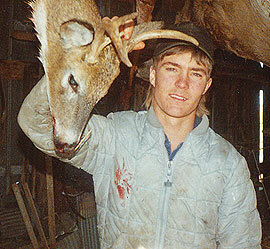 A young Terry Butcher shows off his first whitetail buck he harvested on the family farm. The wrestling trend started with the actual sport of wrestling when Butcher was a second-grader in the Oologah, Okla., school system. Oklahoma is a wrestling hotbed. “Actually, a lot of kids start (wrestling) earlier than second grade in Oklahoma,” Butcher said. As a junior in high school, Butcher took third place in the 123-pound class of the state championships. He moved up to 130 pounds as a high school senior, but injuries kept him from repeating that level of success. Home to the bulls. Butcher had begun riding bulls as a 10-year-old with a neighbor who had a rodeo ring in his yard. “My wrestling coach was always mad at me because I would be riding bulls when we didn’t have wrestling matches,” Butcher recalled. His rodeo career extended a couple of years past high school. “I was doing OK, competing in rodeos within a hundred miles of home,” Butcher said. But the 5-foot-8, 155-pound Butcher knew he was living on borrowed time in the bull ring. Butcher was about 20 years old when the bass fishing bug bit. “My dad bass fished when I was a kid,” Butcher said. “I used to fish, but I was fishing for anything that would bite. Bass fishing can be a little bit slow at times, and I wasn’t into that at all. 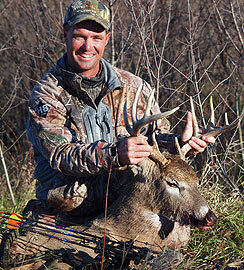 Butcher took this nice Kansas 10-point buck with a bow in the fall of 2010. Soon bass fishing became even more of an “all in the family” event for Butcher. 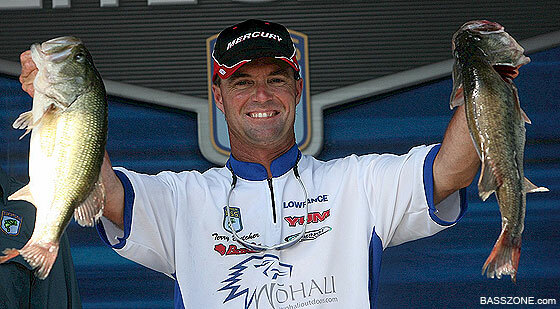 After working his way up from local tournaments to regional events, Butcher qualified for the Bassmaster Elites Series during its initial season in 2006. It was during that season that he became friends with fellow Oklahoma pro Edwin Evers. Evers admitted it was love at first sight when he met Tuesday. Now the Evers family and the Butcher family live about a half-mile apart on the Butcher family cattle farm near the small town of Talala, Okla. Terry and his wife, Kandase, have two daughters, Jessie and Josie. Edwin and Tuesday have a daughter, Kylee, and a son, Kade. There are a few other Butcher family members, including Terry’s father and two of his uncles, living on the acreage that comprises the Butcher cattle farm. Edwin and Terry are bonded by bass fishing, but Evers leaves the cattle ranching to the Butcher family. During the bass fishing offseason, Butcher and Evers enjoy deer hunting. Butcher has been hunting deer with a rifle since he was a kid. He and Evers do their deer hunting with a bow now. Butcher shows off a pair of lunkers he caught during the 2010 Bassmaster Elite Series season. Butcher hasn’t had a whole lot of fun on the Elite Series this year. He got off to a self-described “real bad start,” but has started to turn it around – finishing 23rd on South Carolina’s Lake Murray and 19th at Georgia’s West Point Lake in May. But Butcher takes the ups and downs of life in stride. A few bad days of bass fishing still beats getting knocked out while trying to ride a bull. And Butcher has never been one to complain, no matter what the circumstances. It’s always been about the competition with Butcher. And you don’t have to talk to compete.